LCR systems have become increasingly popular in live installed sound because they provide more articulate panning control throughout the stereo field by adding a discrete center channel. In a traditional stereo configuration, each channel can be panned between the left and right sides. 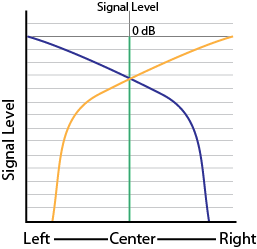 As the signal is panned toward the left, for example, its level increases in the left speaker while decreasing proportionally in the right until it reaches the full ‘hard’ left position. At this point, the signal can only be heard in the left side of the bus. When a channel in a stereo bus is panned center, on the other hand, it is sent equally to both the left and right speakers. This creates a ‘phantom’ center image. Depending on how the left and the right sides of the sound system are positioned relative to the listener, it can be difficult to discern the exact position of the center image. By contrast, an LCR system provides a dedicated center speaker for the center image, making it much tighter and easier to pinpoint. But to get the most out of an LCR loudspeaker system, you must have a digital mixer that can take full advantage of its benefits. The PreSonus StudioLive 64S digital mixer is equipped with its own Mono/Center bus for this purpose. 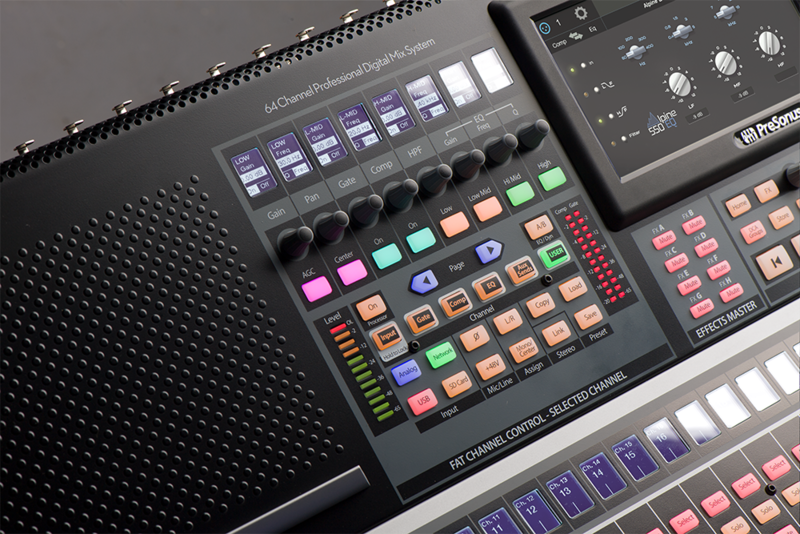 When configured as the Center bus for an LCR mix, a Center Divergence control is provided for each channel. Center divergence allows you to pan each channel across three positions, from left to center to right and back again, or through any position in between. This powerful feature provides a true LCR panning experience and provides more precise panning placement for each channel in your LCR system, affording more clarity and greater system efficiency. 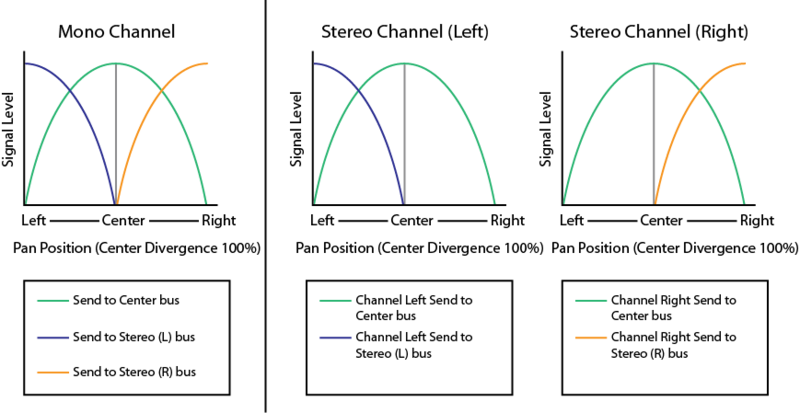 Center Divergence works in conjunction with the pan control, setting the prominence of each channel in the Center bus as the pan position approaches center. When the Center Divergence control is sent to 0% and the channel is panned to center, a mono channel’s signal will be sent equally to the left and right sides of the Main Stereo bus. Stereo channels will retain their stereo positions (i.e. the left side will be sent to the left side of the Main stereo bus and the right side will be sent to the right). This allows you to switch between a LR behavior and LCR behavior depending on your application, making your loudspeaker system more flexible. As the Center Divergence is adjusted from 0% toward 100%, a channel panned to the center will be more prominent in the Center bus as the Center Divergence percentage is increased. 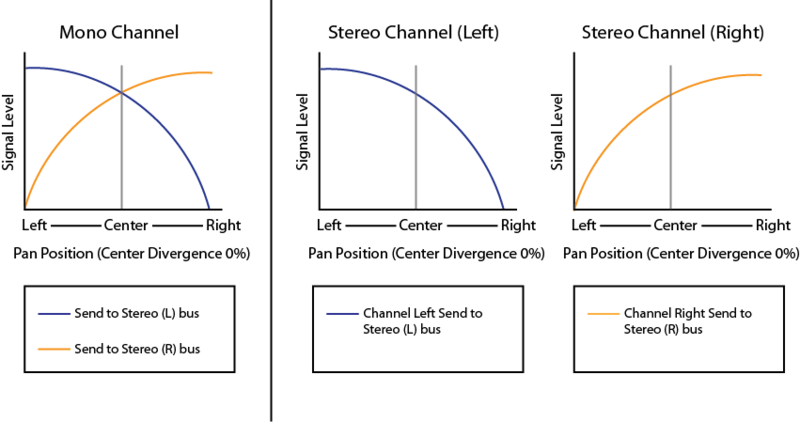 When the Center Divergence is set to 50% and the channel is panned to the center, the signal will be sent to the both sides of the Stereo bus and the Center bus at the same level. When the Center Divergence control is set to 100% and the channel is panned to center, the entire signal will be sent to the Center bus and none will be sent to the Left or Right sides of the Main stereo bus. In this way, Center Divergence allows you to better crossed the image of your LCR system and more precisely place each channel at the position you wish it to be heard in the stereo image.